Three years ago a popular science book called Biblical Plants was published in Chernivtsi. Its authors, scientists from Yurii Fedkovych Chernivtsi National University biologists Stepan Kostyshyn and Svitlana Rudenko, philologist Oksana Ivasiuk, and theologist Mykola Shcherban had found and described 145 trees, bushes, and other plants mentioned in the Bible. At the same time they suggested creating the first Ukrainian Biblical garden. It was planned to set it up at the sacral place, on the territory of the main buildings of Chernivtsi National University where during the pre-Soviet time there was the residence of Bukovynian and Dalmatian metropolitans and now there is the restored philosophical-theological faculty and two functional churches. The garden was supposed to combine the educational and moral mission and be useful for scientists. As many plants from the Bible do not grow in our climate, it is planned to construct special greenhouses for thermophilic plants from the South and soil improvement and drainage for all the plants without exceptions. All these measures, as well as purchasing plants, are very pricy. In 2010 the budget of the Garden of Eden was 2.5 million hryvnias: the sum impossible for the university. However, due to the public reaction in the media (Den was the first to write about the idea to create the Garden of Eden in Chernivtsi) grant institutions offered their financial assistance. The joint project with one of the Romanian universities with the budget of nearly one million euros was promising. The initiators of the garden were inspired by this idea. They cut down the old trees on its territory, rooted up snags and even manually sorted every centimeter of the ground having removed small stones and rests of the roots. However, the time was going by and the project was not progressing. Kostyshyn explained that the reason for this was the limited amount of money for the participation interest. The status of the UNESCO monument implies duly maintaining it that is why the university spends all of its money on this. The real help that the rector of Chernivtsi National University calls the hand of God came unexpectedly. At the end of the last week the Ukrainian Eden was set up. 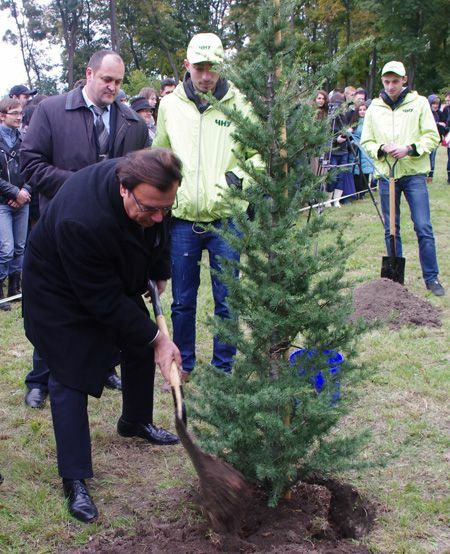 The first Ukrainian Biblical garden was started with the participation of the Israeli Ambassador to Ukraine Reuven Din El, president of the Jewish National Fund Efi Shtenzler (whose ancestors were from Chernivtsi), representatives of all religious confessions, local authorities, local community, administration of the university, and students of the Institute of Biology, Chemistry, and Bioresources of Chernivtsi National University. This event coincided with the 138th anniversary of the university and the 65th anniversary of creation of Israel. The participants of the event planted six Atlantic cedars that had been specially brought by a charter flight from Israel. These trees symbolize the power and the beauty, they are mentioned in the Bible and what is also important, they are firm that is why they have to take on well giving a start to our garden and our cooperation – the guests commented on their choice.